Ukrainian President Petro Poroshenko has said that he will ensure fair, free and democratic elections of the head of state and the Verkhovna Rada in 2019, as well as elections of local government bodies. "I, as president, firmly guarantee free, fair, democratic elections - the election of the head of state, the election of a new parliament, and the election of local government bodies. 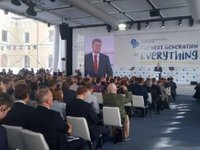 We will defend the free will of citizens," he said at the 15th Annual Meeting of Yalta European Strategy (YES) organized by the Victor Pinchuk Foundation in Kyiv on Friday. According to the president, the election process must comply with the European strategy of the Ukrainian authorities. Poroshenko recalled that under the conditions of Russia's armed aggression the Ukrainian authorities had refused to introduce martial law and impose any restrictions on political rights and freedoms of citizens. "But, of course, the war will definitely leave its mark on the nature of the campaign," he said. Poroshenko noted that over the past four years since the beginning of Russian aggression, Ukraine had managed to restore not only the army, but also reconnaissance. "We have not an approximate but absolutely exact idea of the Kremlin's plans. We know who they want to see in the second round of the presidential elections, and thank God, my name is not there [in the Kremlin's plans]," Poroshenko said. According to him, it is known that on the basis of the "fifth column" Russia wants to form a powerful pro-Russian opposition in the new Ukrainian parliament, "and, if they are lucky, make it a participant with the right of veto for European and Euro-Atlantic integration."